Have you noticed lately that your carpets aren’t giving off the freshest scent? With fun to be had throughout the summer, household chores can take a backseat, resulting in a home that doesn’t smell as great as you’d like it to. With a variety of home remedies, your carpet cleaning company in NJ can help you get that fresh scent back today. From summer vacation fun to preparing a delicious feast at night, the rise of websites like Pinterest have certainly given people a reason to spend some time in the kitchen. Unfortunately, with fantastic recipes can often come flops, or even a tasty dish with a more pungent odor. Carpets do a great job of picking up any scent in your home, which is why you’ll want to do your best to remove these smells quickly. Chefs can try using a small bowl of white vinegar to absorb odor from popular summer favorites like fish, salt to reduce the smell of something burning in the oven, and a heated mixture of lemons, cloves and water to deal with unwanted scents. Whether to take advantage of fresh air or save on air conditioning bills, opening up your windows is a great way to keep your home fresh. Of course, opening your home can also invite allergens and bacteria into your home, which can lead to unpleasing smells. Keep your windows open all summer long with this exciting trick. Simply sprinkle baking soda throughout your carpet and vacuum up the mess about 30 minutes later for a quick fix. Pet owners know firsthand that even with a regular cleaning schedule, it is hard to keep your home smelling as fresh as possible with a pet running around. In order to combat this issue, we recommend a routine maintenance schedule and to neutralize any odors you do come across with baking soda and a bath. 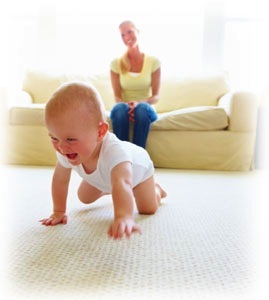 At Best Way Carpet and Tile Cleaning, serving the needs of each and every individual customer is our top priority. While homeowners can find quick fixes in home remedies, the easiest and most effective way to keep your home smelling fresh is to keep to a regular maintenance schedule with the help of your carpet cleaning service in NJ. To learn more about our services at Best Way Carpet and Tile Cleaning, we invite you to give us a call at 732-391-6500 and visit us online at www.bestwaycleaning.net today. This entry was posted on Tuesday, August 6th, 2013 at 11:52 am and is filed under Carpet Cleaning in NJ.